After my Swedish misadventure, it was a few weeks before I felt like doing any baking. When I did decide to get back into it, I was dismayed to find the cupboard where I keep all my baking ingredients had been squatted by an army of minute insects. They were everywhere: in the bags of flour, in the mixing bowls and measuring jugs, and in every nook and cranny of the cupboard itself. I had encountered these creatures once before. 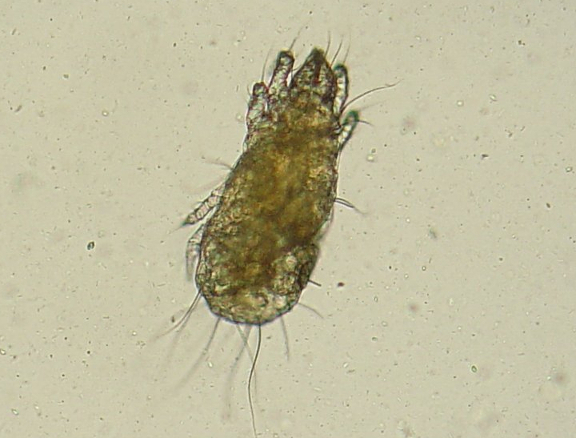 Known variously in English as flour mites, grain mites, or cheese mites, Acarus siro are a common food pest. Although only a fraction of a millimetre long, an established infestation is easy to detect as they reproduce in great numbers. Flour mites themselves are allergenic, as are their faeces, and can cause a range of skin complaints in humans and animals alike. A much older Latin name for these bugs, Tyroglyphus farinae, indicates their historical association with grain: farinae means ‘flour’. Despite this, and their common English names, Acarus siro can feed on just about any human or animal foodstuff, as well as fungi, meaning that they are as happy feasting on decaying food as on fresh. One thing they don’t like is low humidity, which causes them to desiccate and die, so the best way to combat this pest is to keep your dry goods well and truly dry. Once they’ve made a home in your larder, however, you’ll have to throw everything out and clean thoroughly before re-stocking.